The Formal Living Room has a new coat and she seems to really like it. As for me and The Mister, we are still thinking about it. The family room has some new accessories and this time we all agree they are much better! We did a little toddler – created, toddler – friendly Fall and Thanksgiving decorating. As part of that decorating we also learned how to make faux birch bark. It’s still a work in progress, but the wrapped vases in the shot above came out pretty good for a first try. We took the time to search out and speak to the Big Man Himself. With much thought and care the Little Guy was sure to let him know exactly what he wants! I just know it had something to do with Lightning McQueen and Mack Truck. That was based on lip reading since he was speaking in a barely audible whisper. Looking into those twinkling eyes and nuzzled up to that soft beard, my son was nearly speechless. After our encounter with greatness, we did a little furniture shopping for the family room. 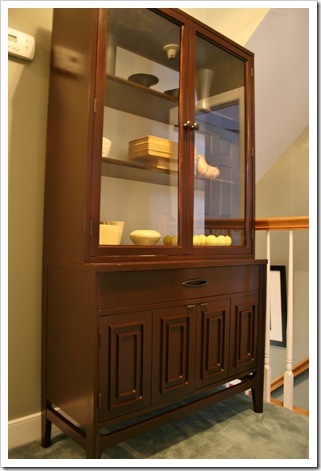 But, I did refinish a small display cabinet for our upstairs landing. Aside from the big T-Day Gorge fest last week, we have been eating our fair share of pumpkin oatmeal. Maybe I should say the Little Guy has been the one really indulging. He has pretty much insisted on eating it every day since it was introduced as Halloween pumpkin oatmeal. I would say I am pretty much over it. I FINALLY put the projects into a one stop shop index. If only I could remember to actually add the projects as I go along. At least doing this monthly recap will help remind me to do it… ah, monthly? Last but not least, I challenged myself at the end of October to complete a project based on inspiration found through Pinterest. I gave myself an entire month to do this one since I was attempting to use materials that I owned along with items from the thrift store. Since thrifting is so hit or miss I wanted to be sure I had enough time. So far I have the frames and they are in the process of being painted. Once I am clear on how all the frames will come together for the wall display, I can order the photos. I’m getting there with this one and hope it will be on the wall by next week. Cross your fingers for me, ‘kay? Oh yeah, one more thing, I was working on an idea for trays to top our rearranged family room side tables. I have the plan but have been unsure about the final look of the trays. After the little birch bark project I think I may have the “look” all worked out. I will be sure to post about that project soon. I know, you are wondering why I didn’t just go out and buy what I needed at a discount store and/or toss the final projects if I didn’t like them. It’s all real time around here. You see, living a retro way of life is all about planning, saving and planning some more. Now, don’t get me wrong, I love the spur of the moment idea and can easily go with the flow as needed. It’s just that when it comes to paying for this life I want to do it as I go and not leave a bill when I am gone. We will get there with this place! Hope you all had a terrific fall and Thanksgiving holiday. Come on, winter!